The Loch Ness Monster is a cryptid, that is a creature that is assumed to be extinct or one whose existence has not yet been confirmed through any scientific means. Other cryptids include Bigfoot and Yeti. The Loch Ness Monster, often referred to as Nessie, is believed to inhabit Loch Ness, a large, deep freshwater lake in Scotland. It is believed that the first sighting of the Loch Ness Monster can be attributed to Saint Columba. Saint Adomnán of Iona in the 7th century wrote in Life of St. Columba of Saint Columba saving the life of a Pict who was being attacked by a monster. However, some argue that this incident occurred in River Ness, not Loch Ness and that early saints often embellished stories when writing. Regardless, sightings of a creature such as Nessie have been reported since the sixteenth century. The modern sighting that caused such a fury occurred in 1933 on July 22. It was on this date that Mr. George Spicer and his wife reported seeing a “most extraordinary form of animal” cross in front of their car as they were driving down the road. They said the animal was about four feet high and twenty-five feet long, with a narrow, long neck. In 1934, a motorcyclist by the name of Arthur Grant reported almost hitting the same creature near the northeastern shore. Also in 1934, Margaret Munro saw the creature from about 200 yards away. She reported it as having elephant like skin, a small head, and a long neck. The Loch Ness Monster has been captured on film several times. Perhaps the most famous is the Surgeon’s Photo, which was reportedly taken in 1934 by Dr. Robert Kenneth Wilson. This is the one that is most recognisable, with the monster sticking its swan-like head out of the water. This photo, however, turned out to be a hoax. In 1993, Christian Spurling, the stepson of Marmaduke Wetherell, admitted that he had made the monster out of plastic and a toy submarine for Wetherell, a big game hunter. Apparently, Wetherell had a beef with the Daily Mail, who had hired him to search for the monster, yet ridiculed him when one was not found. To get revenge, he enlisted the help of Spurling, a sculpture specialist, his son Iam Marmaduke, who bought the materials, and Maurice Chambers, who asked Dr. Wilson to display the photos. In 1938, a South African tourist by the name of Taylor took three minutes of 16 mm colour film of Nessie. The film is now owned by Dr. Maurice Burton. He refuses to let any Loch Ness Monster investigators view the film, only releasing a single frame in his book, The Elusive Monster. In 1960, Tim Dinsdale, an aeronautical engineer filmed a hump that he claimed was Nessie crossing the water. Some said the hump was a boat. In 1993, Discovery made a documentary called Loch Ness Discovered. They enhanced the film and noticed shadow in the negative. The computer expert believed he was able to see a rear body, rear flippers, and one or two humps on the body. 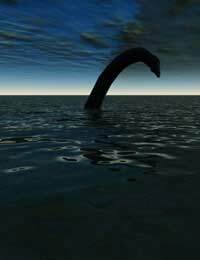 Interest in the Loch Ness Monster was revived again when Gordon Holmes took a video in 2007 of a “jet black thing, about 45 feet long, moving fairly fast in the water.” Marine Biologist Adrian Shine plans to analyse the video, but many call it incredible footage. However, some discount Holmes himself for he has reported numerous sightings of cryptids and published a book and DVD in which he claims fairies exist. The Loch Ness Monster has been described by most to have a long neck and small head. This leads some to believe that what people are actually seeing is a large pike (a type of freshwater fish), a sturgeon (another type of fish), or a dolphin. Some think that the image seen may be a dog, deer, or otter in the water. Another explanation is that the Loch Ness Monster is really an unknown species of long necked eels. That doesn’t seem to be the case as all other species of pinnipeds sunbathe during the day and Nessie has not been seen doing that. Most people who see Nessie describe it as having similar characteristics to a plesiosaur, an aquatic reptile that became extinct about 65 million years ago. As impossible as this seems, proponents of this idea point to the fact that the coelacanth were thought to have been wiped out about the same time as the plesiosaur, yet was found off the coast of South Africa in 1938. But scientists say that the plesiosaur was more than likely cold-blooded and would need to live in much warmer water that than found in Loch Ness. Whether the Loch Ness Monster is real or not remains to be seen. Despite the famous hoax photo, many believe that there is a real monster in this deep lake and continue to search for its existence.